Russian Talmudist; born in Vitebsk 1850; died in Frankfort-on-the-Main Oct. 24, 1884. Among his ancestors were: R. Liva b. Bezalel of Prague, R. Yom-Ṭob Lipman Heller, and R. Moses Kremer of Wilna. His "Toledot Anshe Shem," Warsaw, 1875, which is an attempt at the biographies and genealogies of these notables and their descendants, from a scientific point of view was not very successful (see "Ha-Shaḥar," vii.723-726). He wrote many Talmudical works and commentaries, but only a few of them were published, viz. : "Migdal Dawid," on halakic subjects, containing also some biographies, Mayence, 1873; "Yad Dawid Tebele," Lemberg, 1880, containing addenda to his work "Dibre Dawid," which had appeared five years previously; and "Ḳohelet Dawid ha-Efrati," on Ecclesiastes, Berlin, 1884. Ephrati also published, with the assistance of Israel Hildesheimer, a periodical dealing with rabbinical questions, under the title "Eẓ Ḥayyim," of which several monthly numbers appeared in Lemberg in 1881, and a few in Berlin in 1884. 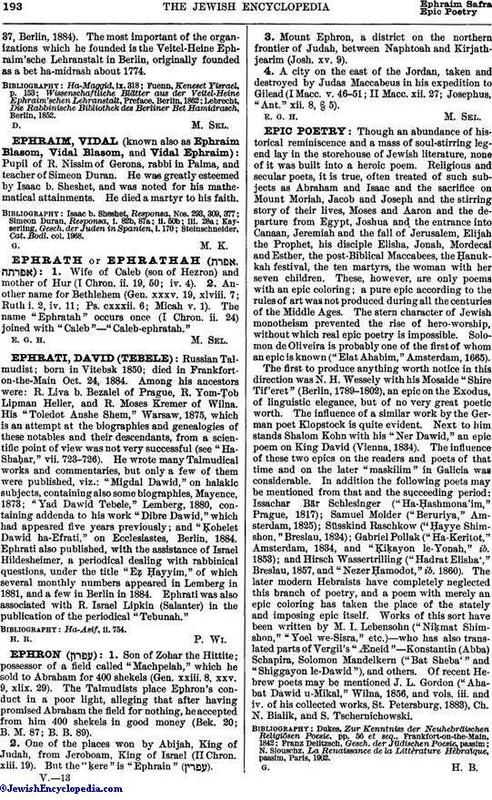 Ephrati was also associated with R. Israel Lipkin (Salanter) in the publication of the periodical "Tebunah."